I've been "camping" three times: summer camp (once), camping at the "Taft Lodge" in Vermont, and roughing it in tents in Maine. They were all fun experiences... once the tears stopped. 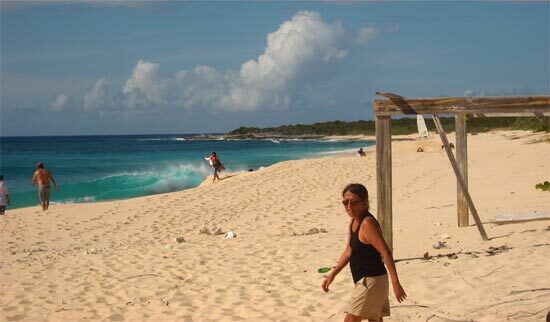 So, you can imagine my relief when I heard about an Anguilla sailing camp trip for boys only. 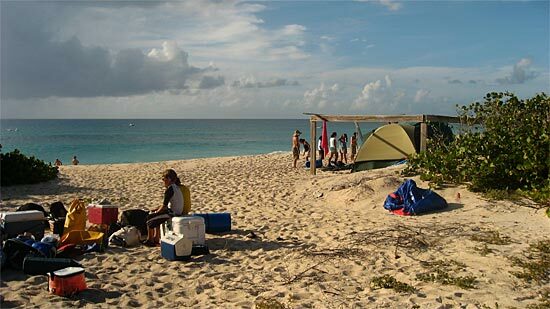 The teenage boys at the Anguilla Sailing Association along with their instructor William Ferguson were set to sail half of Anguilla to Scrub Island on day 1, and set up camp. Day 2 they would sail the rest, landing back on Sandy Ground in the afternoon. "How much fun," I cooed. Too bad I couldn't go. Rats! What a shame. Funny how that all changed. 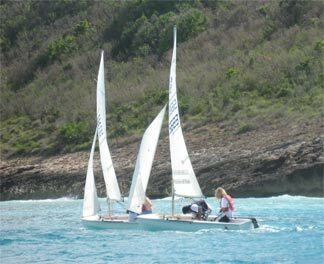 The list of boys grew to a few parent chaperones, young Anguilla sailors, and some girls. Ahem! That meant me and Yuki. Despite our distaste for camping, particularly beach camping!, we couldn't pass on the opportunity. The wind was still the day we took off. 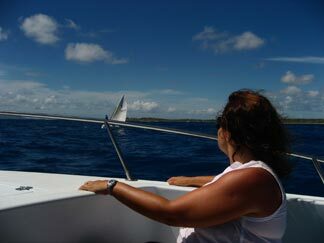 Sailing looked like a long and laborious task! Eight of the boys sailed in 420s all the way along the Northern coast to Scrub Island... That little island you see when you're standing on the tip of Windward Point! The rest of the travelers followed them slowly in speed boats, he! he! It was all smooth sailing. We even spotted a couple of dolphins! 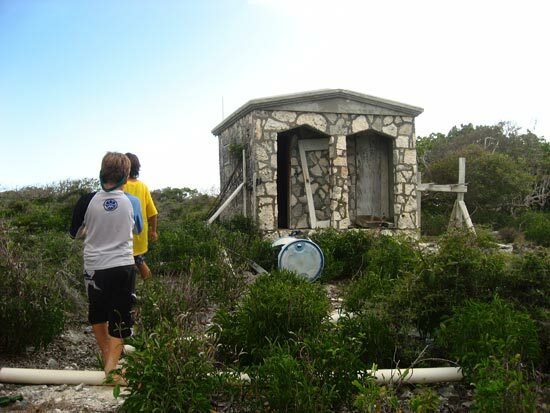 Panic was in the air though, when we arrived at Scrub Island. The swells were enormous... seemingly enough to roll any boat that attempted to get close to shore. How were we going to get people and supplies all the way to the beach? It was going to be OK, Master William Ferguson had a plan of action. He strategically used Martini as a charter boat, landing us all safely on shore, avoiding those huge waves. We breathed a sigh of relief. This was just the tip of the iceberg! 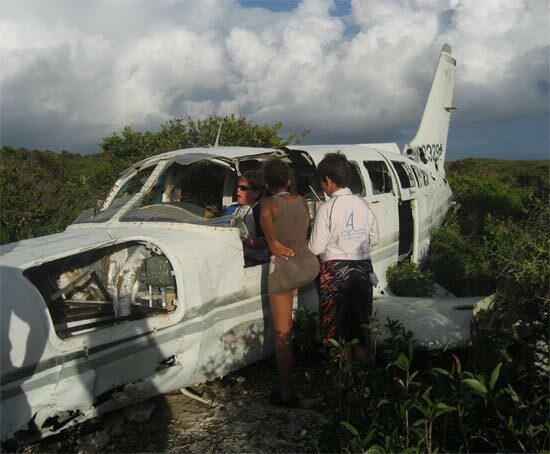 Scrub Island is roughly 3 square miles, with a plane crash site and an abandoned hotel. It felt like a real Scooby-Doo adventure! I couldn't wait to round up the gang and solve a mystery. 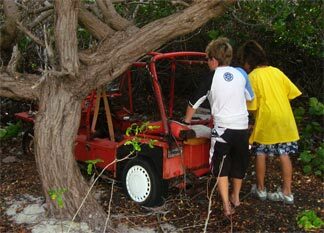 ... Perhaps this one once belonged to the hotel, making small runs around the island? We also spotted two full-size Jeeps right by our campsite! But, it didn't end there. We had more exploring ahead of us. Scrub Island has a truly beautiful, diverse landscape. 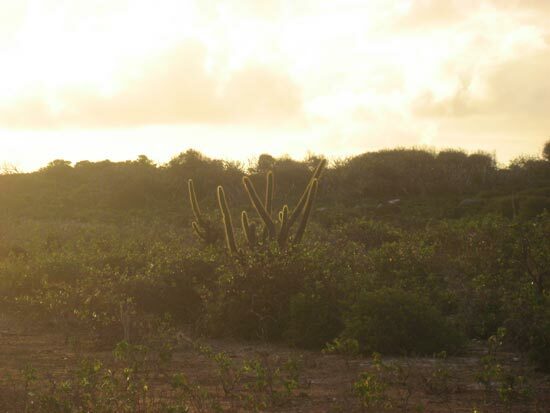 The interior of the island is desert. However, the minute you get to the rocky coastline, it feels as wild as Nova Scotia. This beach was bizarre! It was whimsical... 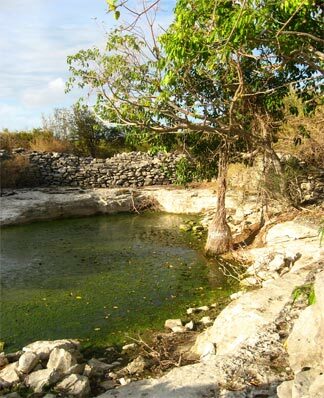 There was a quiet lagoon, which our friend Christian nicknamed "Peter Pan Lagoon", colored light pink and purple, filled with scuttling crabs and coral-colored clams. Meanwhile, ten foot waves were breaking on the boulders behind the quiet enclave. 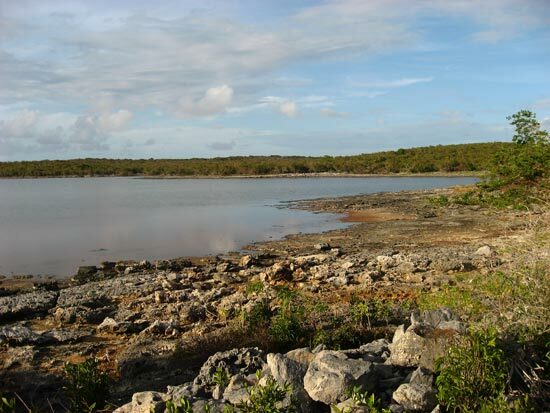 Update: We returned to this very "lagoon," called Deadman's Bay many years later. It's infamous for its treacherous waters. 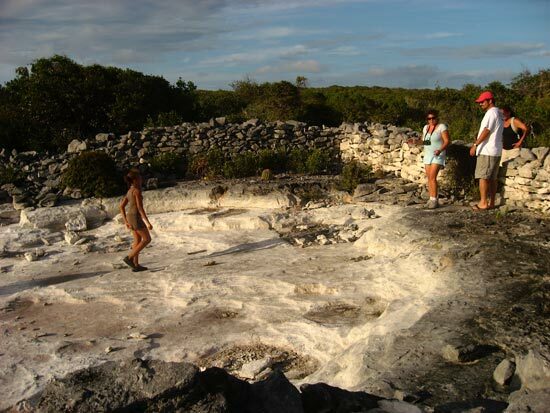 To see more of Deadman's Bay, watch the video below. It's a strange feeling, being on an island totally isolated. We were only sharing the land with goats, lizards, and rats! There was something eerie about it. It only felt creepier once the sun started setting. It was time to make a bee-line back to camp. The haunted hotel would have to wait until our next visit! This is the part of camping I dislike. I love hiking, sailing and swimming, but it's the actual camping that gets me. William and our friend Chantal did prepare heavenly food cooked over an open fire though, and sleeping under the stars was certainly romantic. After hours of playing in the wild waves, we had to de-camp, and try to make it back onto the boat without losing all of our belongings and some limbs! 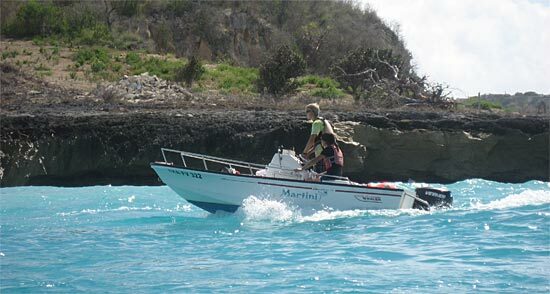 We cruised down Anguilla's south shore, dodging dolphins and just taking it easy. While we were putting our feet up on the motor boats, those boys sailed on. I don't know how they did it after a late night, hiking, swimming, an entire day of sailing, spearfishing, and camping. I spent most of the afternoon snoozing. 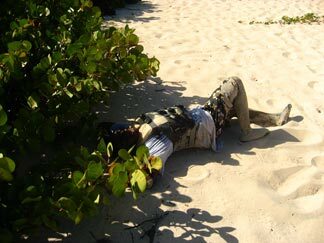 Beach sleeping is a cool experience, but I wouldn't call it refreshing or revitalizing! Refreshed and ready for more, I promptly... Slept all the way back! It had been an exhausting couple of days, rich with experience. Scrub Island was certainly a spectacular site. I wish my Dad hadn't been in Washington, DC that weekend. He would love it. Soon, we'll go back with him and explore the rest of the island. Including that creepy hotel! The Cave at Scrub Island We return to Scrub Island and uncover even more fascinating sites, including giant blow holes and underwater caves! More on Scrub Island here. Deadman's Bay ... we return yet again to Scrub Island, this time to venture inside the infamous Deadman's Bay. See video below for the adventure.